Find Misting Cooling Systems Fittings, H.P Push Lock Fittings, Plastic Push Lock Fittings on Industry Directory, Reliable Manufacturer/Supplier/Factory from China. Product categories of Misting Cooling Systems Fittings, we are specialized manufacturers from China, Misting Cooling Systems Fittings, H.P Push Lock Fittings suppliers/factory, wholesale high-quality products of Plastic Push Lock Fittings R & D and manufacturing, we have the perfect after-sales service and technical support. Look forward to your cooperation! 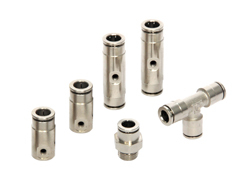 Air-Fluid High Pressure Misting Cooling Systems Fittings is our featured fittings ,which can meet your High Pressure demands, 1500 PSI. Which gives you everything you need to build a outdoor fog-misting system. Fast and Easy – Slip Lock push to connect fittings require no tools except a screw driver. Usage Range: Add Humidity, Suppress Dust , Neutralize Odor, evaporate cooling pest and disease control ,Special effect in amusement parks, pool , etc. Copyright © 2019 www.air-fluidfittings.com All rights reserved.